Really would like some feedback from you guys on our newest product. We have been the leading vendor of 911/930 door panels for years. We have been asked by many 914 owners to develop more 914 products. After nearly a year we finally have 914 door panels in production. We had a big battle forming the top piece and finally decided we would do it in metal like the factory did on some cars. We think the results are spectacular. 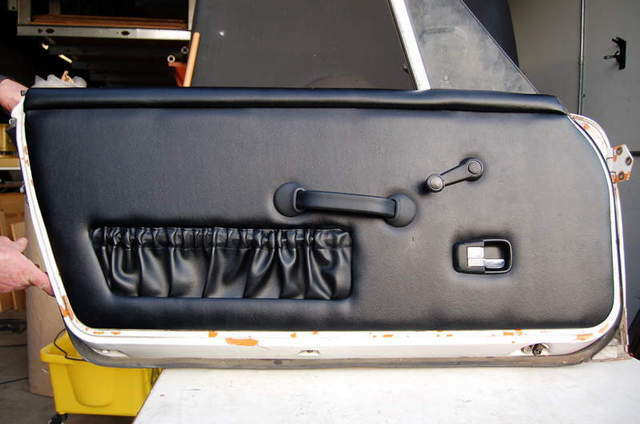 Pictured below is our 914 RS America Plus panel. It features a 911 RS America Handle with OEM Bezels and a 916 style accordion pocket. Pictures of our other 914 panel sets will be added to this post as we upholster them. This model was the most complex so we figured we would tackle it first. We have just begun production and will have several versions of 914 / 916 panels available very soon. For now you would need to purchase them direct, they will be available from Pelican after the first of the year. Again I would really appreciate your comments on these. We really value your opinions and with your help we can make this a terrific product.